Opt for a black and white horizontal striped tank dress if you're looking for an outfit idea for when you want to look casually cool. Opt for a pair of Sophia Webster coco crystal pumps to kick things up to the next level. 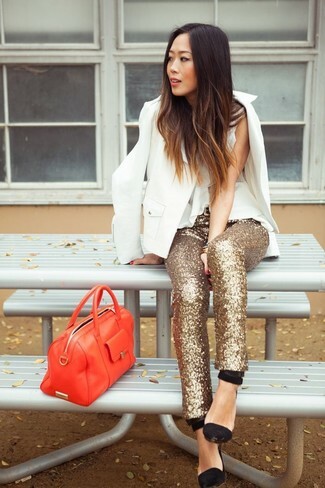 If you're on the lookout for a casual yet absolutely chic ensemble, choose a white blazer and gold sequin skinny pants. Both garments are totally comfy and will look fabulous paired together. When it comes to shoes, this look is round off nicely with Sophia Webster coco crystal pumps from farfetch.com. If you're looking for a casual yet totally chic outfit, choose a black blazer and black capri pants. Both garments are totally comfy and will look fabulous together. Rocking a pair of Sophia Webster coco crystal pumps from farfetch.com is a simple way to add some flair to your ensemble. If you don't like getting too predictable with your ensembles, reach for a grey shirtdress. Kick up the cool of your ensemble by rounding it off with black suede pumps. For those of you who like the comfort look, go for a white and black floral skater dress. And if you want to instantly up the style ante of your look with one piece, add Sophia Webster coco crystal pumps to the equation. If you're searching for a casual yet totally stylish outfit, opt for a black blazer and navy skinny jeans. Both items are totally comfy and will look fabulous paired together. Take a classic approach with the footwear and make Sophia Webster coco crystal pumps your footwear choice. If you're on a mission for a casual yet totally chic getup, try pairing a navy plaid dress shirt with blue ripped skinny jeans. Both items are totally comfy and will look fabulous together. Bring a touch of sophistication to your getup with Sophia Webster coco crystal pumps. If you're after a casual yet totally stylish getup, try pairing a multi colored geometric kimono with a red bodycon dress. Both garments are totally comfy and will look fabulous together. Elevate this ensemble with Sophia Webster coco crystal pumps. This pairing of a black lace long sleeve t-shirt and grey plaid skinny pants is pulled together and yet it looks relaxed and apt for anything. Wearing a pair of Sophia Webster coco crystal pumps is a simple way to add some flair to your ensemble.